Even for people who spend most of their time online, there are still those moments that remind you just how surreal our current technological moment is. Earlier this month, while mindlessly browsing, I suddenly realized I was six comments deep into a Twitter argument between the social media managers of Wendy’s and Steak-umm. Participating in #NationalRoastDay – an annual tradition of lightly making fun of people and brands – the playful hashtag game quickly turned aggressive when the two companies started vehemently attacking each other’s brand voice and products. Just think how little sense that sentence would make to someone in the olden times of 2006. How did we get here? Traditionally, creating a strong brand identity online meant ensuring consistency across your various assets – logo, typeface, taglines – and developing a brand voice. As we’ve spoken about before, your brand voice is the purest expression of your brand’s personality. When used consistently, your voice reinforces the emotional impact you’re trying to create with the people most important to you. Just like a human voice, it sets you apart from others and creates a sense of familiarity that people need in order to form a long-lasting connection. For years, the dissonance between a brand’s voice online and in the real world was pretty slim. And that makes sense because one of the core tenets of brand building is consistency. Yet as time has passed, more and more companies are viewing their online voice as an absurdist off-shoot from their main brand. Denny’s, Wendy’s, Netflix, Chipotle, and MoonPie are classic examples of brands that have fully embraced the surrealism and nihilism of millennial humor. Though often misunderstood, millennial humor is not so different from the Neo-Dada movement of the 1950s and 60s. The use of collage, assemblage, and found materials is in the same spirit as brutalist meme culture. Dada was formed in negative reaction to the horrors and folly of the first world war, so it’s not too difficult to imagine why young people today are responding to a violent and nonsensical world with more nonsense. The fact that companies are tapping into this vein of humor signals our changing expectations of what a brand is, how it speaks, and what we demand of it. It’s not enough for a product to simply work. The market is way too crowded for that. No, even a flawless product has to be attached to a brand that is whip-smart, well-designed, socially-conscious, purpose-driven, and fluent in the ever-changing language of the now. 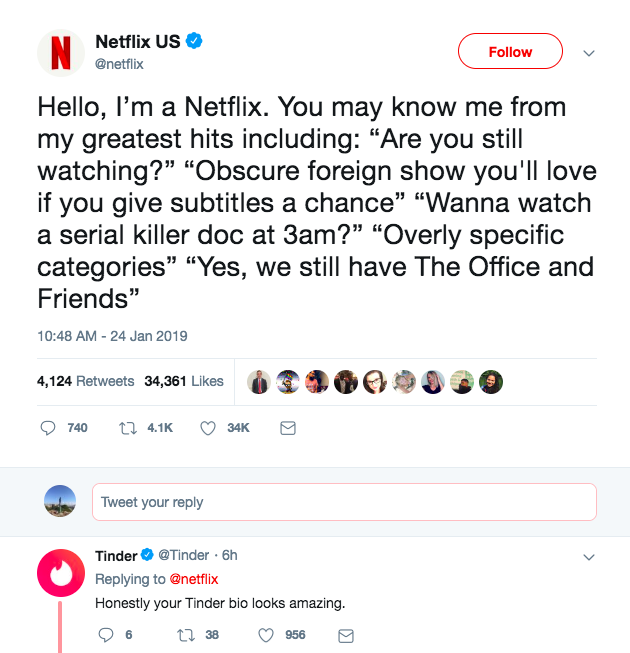 Using the structure of a meme where people share the most common misconceptions about their careers, Netflix treats their product like a profession and lists the biggest stereotypes about the platform. It’s self-deprecating, funny, and most importantly, 100% related to their offering. In the comments, the dating app Tinder replies with, “Honestly your Tinder bio looks amazing.” Again, clever, playful, related to their offering. If you’re still freaked out by the spectacle of corporations pretending to be people for imaginary points on the internet, you’re not alone. But at the end of the day, whether you’re B2B or B2C, every business is human to human. At least until the robots take over, the end result will always be people. If you can find a way to win hearts through humor, they’ll pay you back by voting with their wallets. 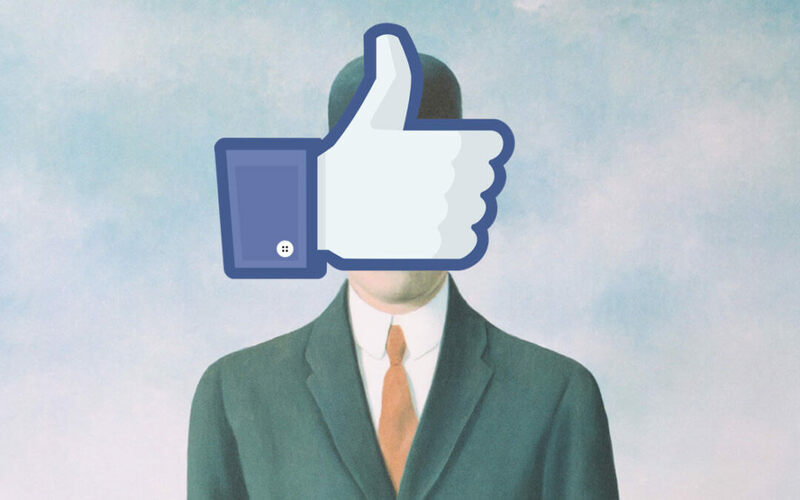 So, if every brand is human to human, does that mean traditional B2B brands can join in on the surrealist fun? That one’s a bit more complicated. The other day, I enjoyed reading Craig Beadle’s blog post, “Four reasons to avoid comedy in B2B marketing (and how to use it anyway). Beadle is a copywriter at Velocity, a content marketing and strategy firm that clearly doesn’t mind embracing humor. They describe themselves as “an odd bunch of international misfits, huddling together for warmth in a cold, indifferent world,” so it’s clear they can take a joke. In brief, the post talks about how comedy and marketing are antithetical at the core. Comedy tends to be singular, divisive, and puts the punchline last. Marketing tends to be consensus-driven, direct, and tells you everything upfront. Yet they share a common goal of communicating information in a human, delightful way. There is a sugar-hit of recognition when you “get” a clever ad, in the same way that jokes and riddles are entertaining. As famed ad-man David Ogilvy said, “The best ideas come as jokes. Make your thinking as funny as possible.” So, let’s look at some funny-thinking B2B brands. Zendesk makes cloud-based customer service software and support ticketing systems. Are you laughing yet? 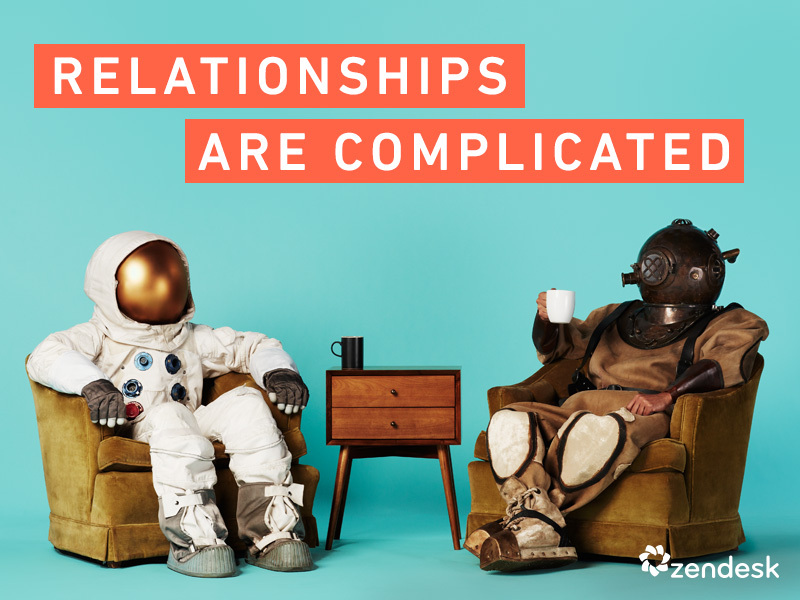 Nothing about what they do should be inherently funny, but they were able to drill down to one value proposition with real comedic potential: relationships are complicated, and Zendesk improves the relationships between customers and companies. Represented by an astronaut and a deep-sea diver, they created a series of 16-second videos exploring relationship tensions. Like many businesses in Silicon Valley, MailChimp is a great company with an awful name. That’s not a value judgment, it’s something they know and have actively leveraged into a massive, self-referential campaign. 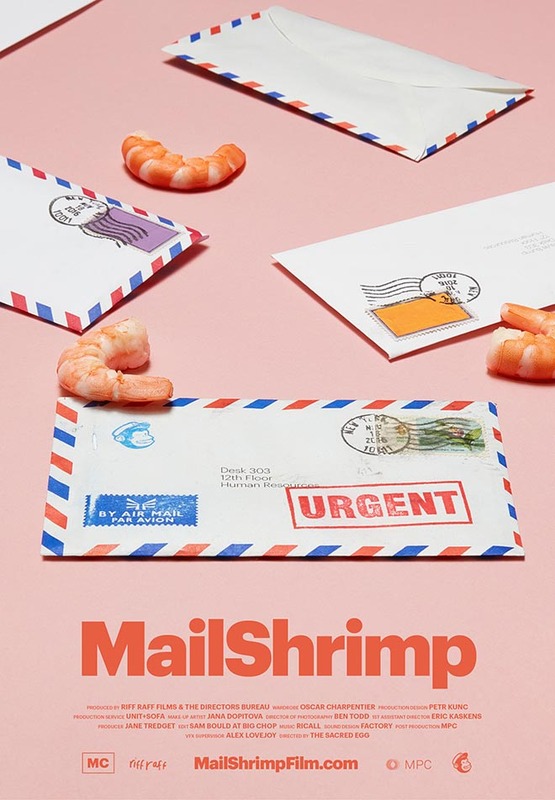 The “Did you mean MailChimp?” campaign centered around nine ways you could possibly mess up their name, each with its own faux product. The results were brilliant and bizarre creations like FailChips, KaleLimp, and MailShrimp. If humor is about following through on a joke, you’ve got to hand it to them. The FailChip leg of the campaign featured a web page, product packaging, and a distribution strategy for the pre-crushed chips. 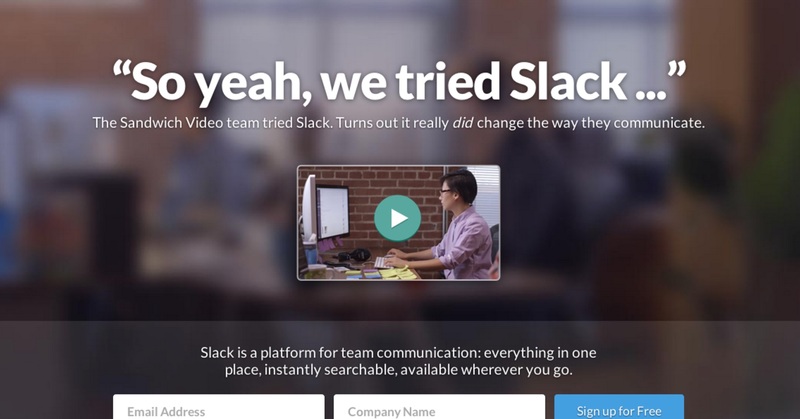 Slack’s mission is to change the ways teams communicate. There is a lot of comedy in the minutia of office life and working on projects – just look at “The Office.” So, it only makes sense that they went super meta, producing a video about the process of making a video for Slack. Throughout the spot, we see all the points of friction their product solves. The end result is a clever case study, showing a reluctant client slowly falling in love with Slack. In conclusion, it’s a super strange time for brands, technology, comedy, and honestly just being alive in general. We know there will always be stakeholders to appease, risks to be assessed, and reputations to manage. But if you find something genuine and funny about your core offering, don’t be afraid to inject your brand voice with a little life. People will forgive a lame joke, but they’ll never forgive a boring brand. To learn more about how to improve your brand voice, contact Founding Partner Tracy Lloyd at tracyl@emotivebrand.com.